Obstacles are an important facet of Armored Task Force scenarios. They either allow the player to canalize the enemy if he is defending or form a hurdle for him to overcome if he is attacking. While you can add obstacles manually, it is easiest to add them in 'blocks'. 1. 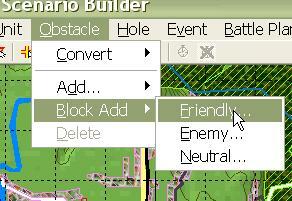 Select 'Friendly' from the 'Block Add' sub-menu of the 'Obstacle' menu. 2. 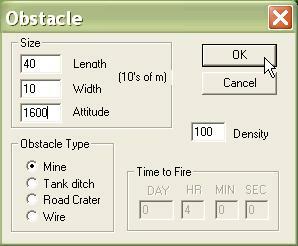 The attributes in the Obstacle dialog will be applied to every obstacle in the block that you create. Length, Width. The size (in tens of meters) of the obstacles. Attitude. The orientation of the length of the obstacle in mils (0-6400, 0 is north, clockwise angle). Obstacle Type. The type of obstacle effects what type of breaching vehicle can breach it and, in the case of Road Craters, the shape of the obstacle and when it becomes effective. Density. A very low density obstacle will only stop a percentage of the vehicles that pass through it. Time to Fire. Only used with Road Craters. 4. You will also be prompted to enter the number of rows of obstacles in the block. 5. When you move the cursor to the map, you will find that you are dragging a block of obstacles with the attributes you specified. Left-click anywhere on the map to 'drop' the obstacles in position.